PEDIGREE DOG OR CROSSBREED ? What follows is a brief outline of the differences between a pedigree and a crossbreed dog and the important points about each when considering having a dog in your family. I will cover the different breeds and some of their attributes and misgivings in more detail in a later chapter. One of the plus points for pedigree dogs is that you will have a certain idea about the eventual physical attributes of your dog. You can be relatively sure about his/her adult size, height, length, weight (assuming proper exercise and nutrition). You can be fairly sure about coat type, length and colour too. On the other hand with crosses this is not so easy, if you have a small mother and father chances are you will end up with a small adult dog and vicer versa for large parents. If the parents are of mixed sizes then who knows. With crosses if you go for the puppies which have both parents of breeds with a nervous predisposition say a collie and a GSD chances are the pup will inherit those genes too, whether they end up being a very nervous dog is down to its environment and early learning as a puppy and how that affects the manifestation of those genes; obviously the same could be said for a pedigree pup if mum and dad were both very nervous dogs. The above thinking can also be applied to aggression cases, if mum or dad is overtly aggressive then why take the risk, there can be inherent genes for aggression, so unless you truly know dogs well steer clear of their pups. While on the subject of hereditary genes, many clinical problems like forms of Arthritus and many others can be passed on so again try to ensure mum and dad are sound. With pedigree dogs you can also have an idea about some behaviours or traits that certain breeds might carry out, this is known as breed specific behaviour/traits. These genetically inherited behaviours will have an effect on the adult dog that you end up with, genetic urges may well drive the behaviours of your dog to some extent, though how things manifest will be profoundly influenced by your dogs early learning and the environment that they go through. 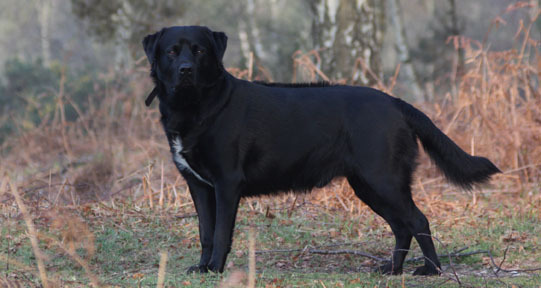 Some good examples of this breed specific behaviour and traits would be the collie to herding, the bloodhound to scenting, the Rottwieler to guarding, the Newfoundland to swimming, the Labrador retriever to a good temperament, the Staffordshire bull terrier to loving people and the German shepherd dog to wanting to be a higher status dog. Some of these breed specific behaviours might be important to you if you plan to do certain things with your dog like going shooting or doing agility at a high level and so might influence your choice. The above is only a small selection of breed specific behaviours, but I would like to add again that how these genetically inherited behaviours and traits finally express themselves in the adult dog will be influenced and shaped by that individual dogs early learning and the environment they experience this in. With cross bred dogs again your best way of predicting a potential pups behaviour is to look closely at mum and dad, if dad is an in your face, mad as a hatter staffie and mum is a laid back soft as they come Labrador then again, who knows what the outcome may be, but if you have the pup from the right age from a responsible owner/breeder and bring it up in the correct manner and in a good neutering environment then all should be well. Look at the /picking-the-right-puppy-for-me and the /which-breed-dog-or-crossbreed-is-best topics for further help. Without wanting to sound bias I myself have always had crosses as my own dogs and I loved them. People do say that a pedigree dog will find a home easier than a cross and to some extent this is true, you will not find so many pedigree dogs in rescue centres as crosses, though many pedigree dogs do have their own breed rescue groups (a good source of breed information, ring them) so appear less in general rescue centres. Personally, I think that both pedigree and crosses have their own things going for them and both will have the same canine issues that all dogs have, these need to be addressed just the same for a pedigree or a cross bred dog for a happy life for all concerned; hopefully reading on will help you achieve this. For more help have a look at my /which-breed-dog-or-crossbreed-is-best page. Why not take a look at my first book, a realistic novel about a wolf called Elmer, his family and their life. My hope is that you would read this and learn much about wolves and mother nature, coming to understand why man first thought about domesticating these lovely animals to give us our best friend, the dog.